Will Obama Pick Another Fight with Israel? Originally published under the title, "Picking Another Fight with Israel." President Obama is considering abandoning the decades-long U.S. policy of standing with Israel at the UN. The concessions that President Obama is making to Iran have alarmed not just the right in Israel but also the left, and forced pro-Israel Democrats to choose between loyalty to the President and steadfast support for the Jewish state. Even former Secretary of State Hillary Clinton has cautioned that "we need to all work together to return the special U.S.-Israel relationship to constructive footing, to get back to basic shared concerns and interests." But the President apparently intends to go in another direction, to open a second conflict with Israel over its vital interests. According to Bloomberg News, "The administration has signaled that it might abandon the decades-long U.S. policy of protecting Israel at the UN and back a [French]Security Council resolution laying out terms for a two-state solution …Robert Malley, the Middle East director for President Barack Obama's National Security Council, told at least one European nation" that the Administration may support a resolution "defining the parameters for a Mideast peace agreement, according to a report on the conversation to superiors by a Washington-based European diplomat…viewed by Bloomberg News." 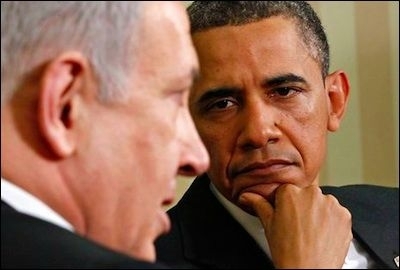 President Obama apparently intends to open a second conflict with Israel over its vital interests. Foreign Minister Laurent Fabius, says the purpose of his UN resolution is "pressure…from the international community" to dictate "clear parameters" for negotiations that must be concluded within 24 months. According to the French draft circulated in November, it is the UN Security Council that "decides" the parameters of the "negotiated solution." It also rules that henceforward the negotiations should include "close involvement, alongside the parties, of major stakeholders" to continue to pressure the parties during the bilateral negotiations. This resolution would be a triumph for those who have long wanted the Great Powers to dictate Israel's future, as demanded by the Arab League since Israel's creation. The Jewish people returned to their ancestral home so they could make a Jewish decision about their own destiny and no longer be subject to the will of others. This resolution seizes that authority and moves it to a forum where Israel is not even a member, a body aptly described by U.S. Ambassador Jeanne Kirkpatrick three decades ago: "The Security Council more closely resembles a mugging than either a political debate or an effort at problem-solving….Israel is cast as villain…in [a] melodrama…that features…many attackers and a great deal of verbal violence…The goal is isolation and humiliation of the victim." A UN resolution imposing solutions to the conflict contradicts the Obama Administration's own declared principles. A resolution to impose solutions also contradicts the Obama Administration's own principles enunciated on February 18, 2011, by U.S. Ambassador to the UN Susan Rice (now the President's National Security Adviser), "We think it unwise for this Council to attempt to resolve the core issues that divide Israelis and Palestinians… The only way to reach that common goal is through direct negotiations between the parties… It is the Israelis' and Palestinians' conflict, and even the best-intentioned outsiders cannot resolve it for them." Such a resolution at the Security Council "risks hardening the positions of both sides. It could encourage the parties to stay out of negotiations and, if and when they did resume, to return to the Security Council whenever they reach an impasse." The specific terms of the draft French resolution make it more onerous. It demands "a full phased withdrawal of Israeli security forces," without reference to Israel's right to secure borders previously guaranteed by Resolution 242 in 1967. In this resolution, the cardinal rule is that "Security arrangements must respect the sovereignty…of Palestine" to be "within the framework established by this resolution." Most Israelis believe that full withdrawal of the IDF from the West Bank under today's conditions would lead quickly to a takeover by Hamas, which is being armed by Iran to overpower the Palestinian Authority (PA). General Yaakov Amidror, who was national security adviser to Prime Minister Netanyahu until November 2013, said that, without the presence of the IDF, the PA "cannot survive for even 10 minutes." Mr. Abbas himself confronted Hamas leader Khaled Meshaal directly in August 2014 about Hamas plots in the West Bank. "You smuggle weapons, explosives, and cash to the West Bank, not for the fight with Israel, but for a coup against the PA…My security agencies have proof." Mr. Abbas said that the IDF "arrested 93 Hamas members who were preparing for a coup against the PA in the West Bank." In June 2007, Mr. Abbas accused Hamas of trying to assassinate him and publicly condemned Hamas as "murderous terrorists" and "coup plotters." A Hamas state in the West Bank, or a collapse of central authority and the eruption of civil war there, would be a disaster for Israel. A West Bank swarming with rockets, missiles, and suicide bombers would bring the war to Israel's adjacent heartland. With Jerusalem as "the shared capital of the two States," as demanded by the resolution, there would not be any barrier to terrorist infiltration into Israel. Hamas covets the West Bank because it knows that the West Bank's proximity to the Israeli heartland would make it a much more effective platform for attacks on Israel, than firing from Gaza. In September 2014, Hamas founder Mahmoud Al-Zahar said that if his movement were to "transfer what it has or just a small part of it to the West Bank, we would be able to settle the battle of the final promise with a speed that no one can imagine." In another speech he said, "If only the West Bank had one quarter of what Gaza has of resistance tools, the Israeli entity would end in one day…Can you imagine what would happen if the enemy is targeted from the West Bank…?" The French draft resolution says in effect that Israelis have no right to be in the lands of their forefathers. Beyond the security issue, the French draft UN resolution also says in effect that the people of Israel have no right to be in the lands of their forefathers. It determines that Israeli communities outside the 1949 Armistice Line (never a recognized legal boundary), including those in the eastern part of Jerusalem and near the Tomb of the Patriarchs in Hebron and in the large Jerusalem suburb of Maale Adumim, "have no legal validity." In one stroke, the UN would threaten the titles to their homes of 41% of the Jews living in Jerusalem, those in Jewish neighborhoods like Ramot, Ramat Shlomo, Neve Yaakov, Pisgat Ze'ev, East Talpiot, Har Homa and Gilo. Mr. Obama's own Middle East envoy George Mitchell said, "The Israelis are not going to stop…construction in East Jerusalem. For the Israelis, what they're building in is in part of Israel…We could spend the next 14 years arguing over disputed legal issues, or we can try to get a negotiation to resolve them in a manner that meets the aspirations of both societies." If Mr. Obama takes us down this road by endorsing a Security Council resolution so profoundly injurious to Israel, we are all in for an even rougher ride than the past few months. In the forty years since President Richard Nixon's first veto in Israel's defense on September 10, 1972, every American president has used the veto to block anti-Israel resolutions at the UN Security Council. a total of 8 Presidents casting 42 vetoes in Israel's defense. (Even Jimmy Carter vetoed one, though he voted for another.) If Mr. Obama breaks with this tradition, he will be taking conflict with Israel to new heights. A dozen leading House Democrats, all Jewish, have told deputy national security adviser Ben Rhodes that Obama should stop acting as if only Israel is holding up the peace process while not expressing a word of disappointment about Palestinian President Mahmoud Abbas. One said, "You want us to go out and say the administration's got Israel's back [in the Iran negotiations]. How are you going to get us to say that when our constituents believe that the administration is stabbing Israel in the back?" Steven J. Rosen is the director of The Washington Project at the Middle East Forum.